It is with great sadness that we announce the passing of Earl on March 24, 2016. Below is an obituary written by Earl's devoted friend, James Person. 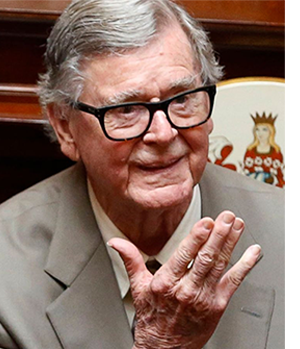 Best known as the creator, executive producer, and warm narrative voice of the long-running television series The Waltons, writer Earl Hamner died Thursday, March 24, in Los Angeles at Cedars Sinai Medical Center. He was 92 and had battled cancer for nearly two years. He is survived by Jane, his wife of 61 years, as well as his son Scott, himself an accomplished writer, and daughter Caroline, a family counselor. Born into a large affectionate family in Virginia's Blue Ridge foothills in 1923, Hamner knew from an early age that he wanted to be a writer. He grew up during the Great Depression, an era that captured his imagination and later served as the time setting of his best-known novels and TV series. 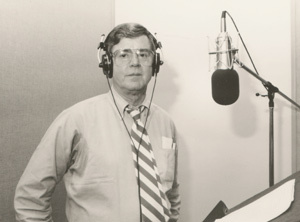 After seeing active service in the U.S. Army during World War II and then interning as a writer for radio station WLW in Cincinnati, Hamner began writing for radio (and later, television) programs in New York, notably The Today Show. In 1961, with television transitioning from live programming to film, he relocated to Los Angeles, where he soon became a contributor of scripts to The Twilight Zone, hosted by a man he had known at WLW, Rod Serling. He also published the autobiographical novel Spencer's Mountain, which was praised at length by novelist Harper Lee and adapted to a successful film starring Henry Fonda and Maureen O'Hara. In these and his teleplays for other series, in his novels, and in his film adaptations of Johanna Spyri's Heidi and E. B. White's Charlotte's Web, Hamner brought a warm, affirming sense of traditional, timeless wisdom that affirmed love as the essential quality that makes life worth living. He embraced William Faulkner's famous credo: "I believe that man will not merely endure: he will prevail. He is immortal . . . because he has a soul, a spirit capable of compassion and sacrifice and endurance. . . . The poet's voice need not merely be the record of man, it can be one of the props, the pillars to help him endure and prevail." Hamner kept a typed copy of those words tacked to the wall of his office. He won the Christopher Award five times and also took home the coveted George Foster Peabody Award in 1972 and an Emmy Award for Outstanding Drama (Continuing) in 1973 for The Waltons. Despite having achieved this level of success and international recognition, he remained the real-life John-Boy Walton, never losing his affection for the folkways, old stories, traditions, and manners of the family united in loving community with its members, close friends, and the larger community, living on family land or on long-familiar ground. In his autobiographical works of imagination especially--Spencer's Mountain, the CBS drama Appalachian Autumn, The Homecoming, and even the nighttime drama Falcon Crest--the past forever flows into the present. 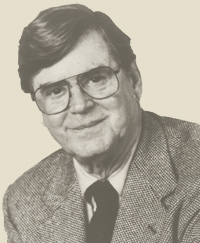 In one of the narrations that bookended an episode of The Waltons, Hamner wrote: "Some men are drawn to oceans, they cannot breathe unless the air is scented with a salty mist. Others are drawn to land that is flat, and the air is sullen and is leaden as August. My people were drawn to mountains. They came when the country was young and they settled in the upland country of Virginia that is still misted with a haze of blue which gives those mountains their name. . . . In my time, I have come to know them. . . . I have walked the land in the footsteps of all my fathers. I saw yesterday and now look to tomorrow." Until the end of his life, Hamner held to a personal vision of television and motion pictures as media for affirming the better angels of human nature, reminding his audience that the past is never dead; it's not even past. His world of wondering boyhood and moral imagination can never stale. In Depression-era Walton's Mountain, in the opulence of Falcon Crest, even in the unnerving alternative worlds of The Twilight Zone, he created worlds to delight in and revisit time and again. CLICK HERE to read a collection of some personal thoughts James shared about Earl. When I was growing up in the Blue Ridge Mountains of Virginia during the Great Depression, we always had friends and neighbors stopping by. My mother or father would meet them at the door and say: "Come on in and sit till bedtime!" Please do that. Come on in to my website and stay as long as you like. While you're here, let me tell you about the books I've written, and many other publications where there are articles that might interest you. For over 50 years I've been working in television and have seen it grow and change -- not always for the best -- but here I've recorded how the industry evolved and how I took part in that evolution. I am in the process of recording my book, THE AVOCADO DRIVE ZOO, chapter by chapter, which you can listen to here soon. I will let you know when it is available. Lastly, there's a blog. I call it YOU ME AND THE LAMP POST. I'll let you in on whatever adventures I happen to fall into and also share occasional thoughts about writing that hopefully might be useful to other writers -- beginners or professionals. So be my guest. It's nice to have you here. And stay till bedtime or as long as you like! P. S. Sign up for email updates and I will let you know about new features, newly published work, public appearances, or breaking news in general.